Hi there! Now that it’s cold and my skin is really dry, I thought I’d treat myself to a few new shower creams. 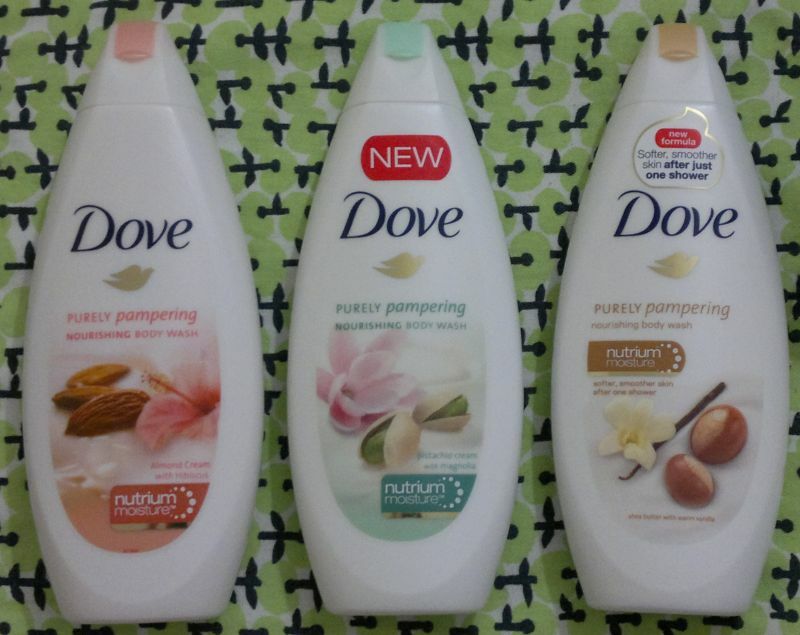 Meet Dove Purely Pampering Almond Cream with Hibiscus, Pistachio Cream with Magnolia and Shea Butter with Warm Vanilla. Let me start with the Almond and Hibiscus shower cream which also happens to be my favourite of the three. This shower cream smells absolutely delicious – like hot chocolate with a touch of almond milk. I’ll definitely buy it again – soon! I don’t care much for the Pistachio and Magnolia shower cream. The fragrance isn’t bad. It just doesn’t tickle my fancy. Well, and it started to annoy me a bit half-way through the bottle. I won’t repurchase this one. The Shea Butter and Vanilla shower cream smells wonderful. The fragrance is sweet, warm, comforting and cuddly. It’s almost as lovely as the almond and hibiscus fragrance. I will definitely buy this one again! Hi there! I’m sorry I’ve been absent all week. I was too busy with work. I’m so glad I’m not working tomorrow, so I’ll be having some quality time this weekend. 🙂 And to celebrate the happy 48 hours that await, I’ll show you my cute multi-owl necklace. It’s really cute, eh? It’s another Claire’s necklace. I don’t remember how much I paid for it, but I’m pretty sure I bought it for half price. 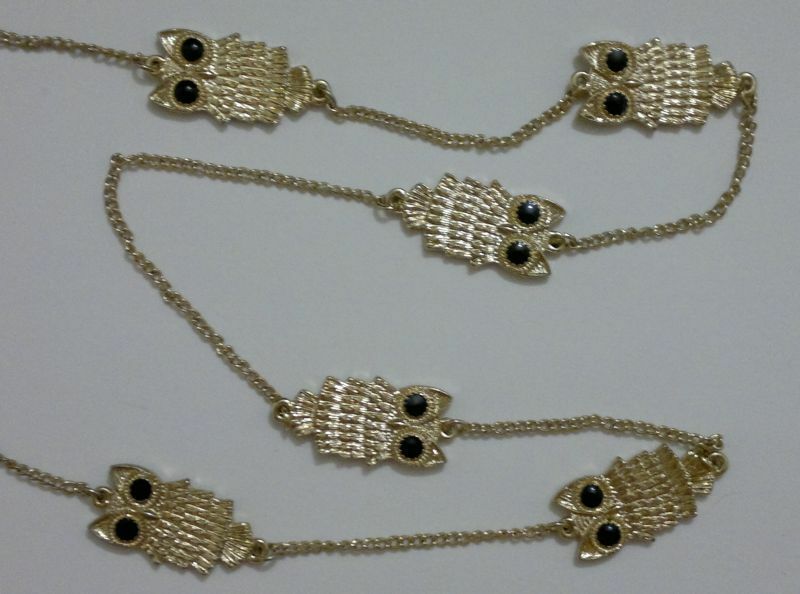 What I really like about this necklace is that’s got six cute little owls (they’re about 3cm tall). I can’t wear this necklace to work because, well, look at it! 😀 But I love to wear it in my own time and I think it looks great with with random black or navy tops because the owls really stand out. Any random cuteness you want to share? Let me know, because I love cute things! Hi there! Today’s post is not a review. But I wanted to show off my new L’Oréal top coats. 🙂 The first four toppers (from left to right) are 926 Independence Day (red, blue and white hex glitter), 927 Splash Peach (pastel yellow and peach hex glitter), 929 Graffiti D’Amour (red, pink and white hex glittr), and 925 Mini Camouflage (black and light green hex glitter). 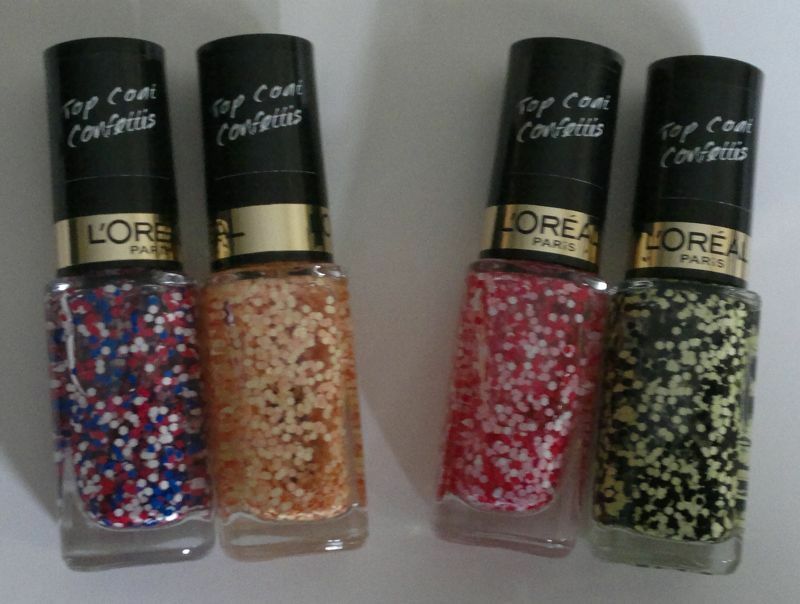 These beauties are from L’Oréal’s Confettis top coat collection. And (from left to right) these are the remaining four pretty toppers: 919 Grace Tweed (turquoise and white feather-style bar glitter) and 917 Jackie Tweed (pale yellow, orange and light blue feather-style bar glitter) from L’Oréal’s Tweed range. 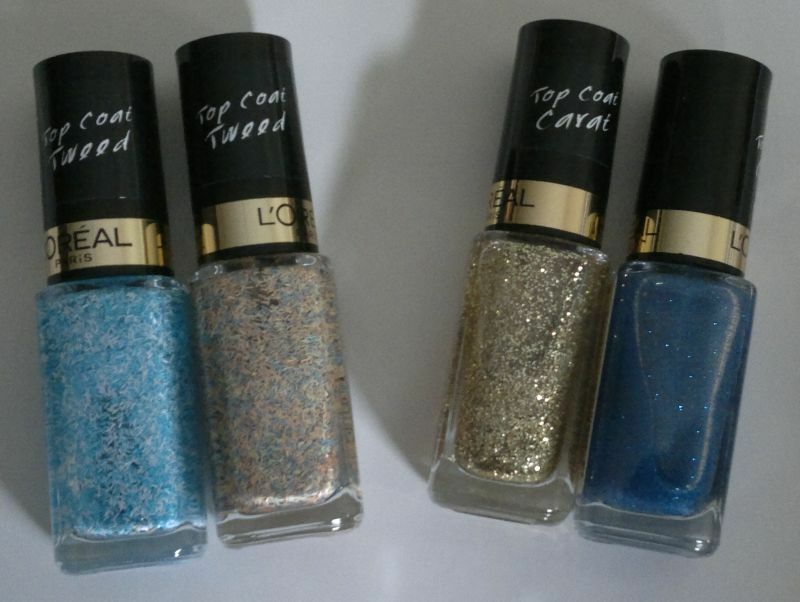 And 910 Gold Carat (gold topper) and 909 Saphyr Carat (shimmery blue glitter) from L’Oréal’s Carat collection. Hi there! 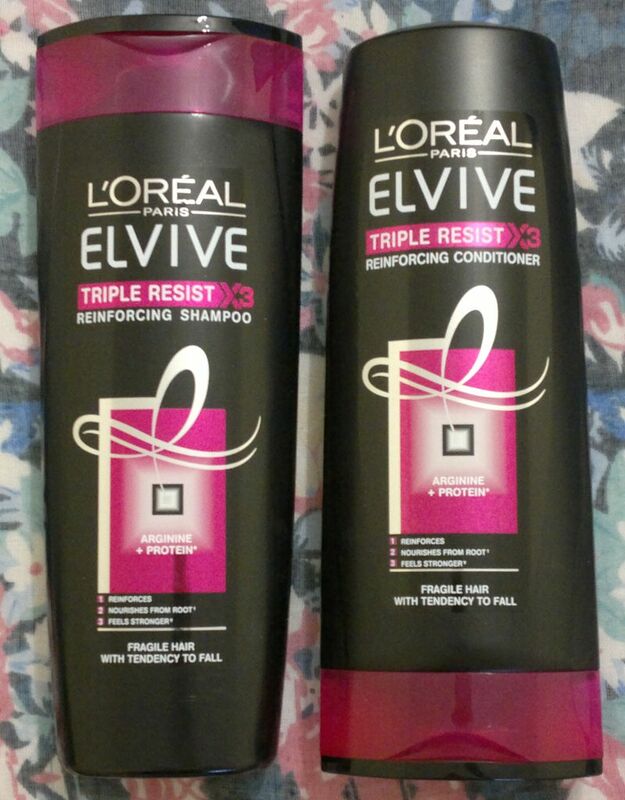 I just started to use L’Oréal’s Triple Resist Reinforcing Shampoo & Conditioner again. I haven’t had these ones in ages – because whenever there’s a half price or BOGOF offer, one of the two products is always out of stock. But I was lucky the other day – so I bought a few L’Oréal shampoos and conditioners for half price. Now let’s get to these products. The reinforcing shampoo is one of my favourites. It cleanses my scalp and my hair without irritating my skin. I love the shampoo and I’ll buy it again. The conditioner is quite good too. I remember it being thinner and easier to use. But it’s still a very decent product that conditions and detangles my hair well. I think this shampoo and conditioner combo really helps with certain hair loss issues. It won’t sort out hair loss caused by medical conditions or hormones and the likes. But whenever I use these two products, I notice a huge difference in how much hair I’m losing – from day one. I don’t know how L’Oréal did it, but they’ve done a great job with these products. I would definitely recommend this shampoo/conditioner combo – regardless of whether your hair needs strengthening or not. L’Oréal’s Triple Resist Reinforcing Shampoo & Conditioner are available as 250ml for £2.99 each, and 400ml for £3.99 each. Hi there! 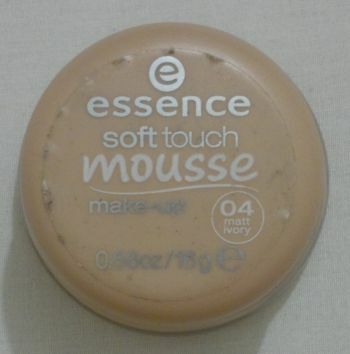 Today’s post is about Essence’s Soft Touch Mousse Make-Up. I chose the lightest shade – 04 Matt Ivory. Let me tell you right away that I didn’t like this foundation. That’s not because the product is horrendous (it’s not) – but because it doesn’t agree with my skin. Now let me explain why this foundation didn’t work for me. I have dry skin and I suffer from eczema. My holy grail of make-up – Max Factor’s Pan Stik – often makes me forget that I have difficult skin. I also didn’t like that the lightest shade – Matt Ivory – was too dark for me. If you’d like a comparison: Essence’s Matt Ivory is a tad darker than Maybelline’s Ivory (mousse foundation). So if you look for a mousse foundation that’s lighter than Maybelline’s Light Porcelain, keep looking! I can see that Essence’s Soft Touch Mousse Make-Up could work for women with oily skin. But if you have dry skin, I doubt this foundation will bring you any joy. If you’d like to try this foundation, it’s available for £3.80 at Wilko’s. Hi there! If you read my blog, you know I’ve been buying all things I Love… lately. I bought quite a few body mists (and other products) – for £1 each from Poundland! Here’s the haul post. I thought I was very lucky that I Love…’s 2015 Christmas collection hit the bargain stores. I already had the shower gel and the body butter. So I was happy to try the I Love… Cherry Almond Sparkle Refreshing Body Spritzer as well. However, after trying the body mist, I have to say it’s not for me. Whilst the shower gel and body butter do smell like cherry bakewell tarts, the body mist smells like a mix of almonds and baked bread – without the tiniest hint of cherries. And when the fragrance dries down, it leaves behind a bread-like scent on my skin and my clothes. I may be too critical, but I don’t like the smell or the taste of bread, so I won’t be using this body mist again. But the product won’t be wasted. It’s going in my beauty box for the women’s shelter. Hopefully someone else will like this body mist a lot more. If you would like to try I Love… Cherry Almond Sparkle Refreshing Body Spritzer, it’s £2.99 at Superdrug’s or onlline. Or swing by your local Poundland where you might find it for £1.